Two fascinating characters from the early days of motor racing will be honoured at this year’s Donington Historic Festival (30th April, 1st & 2nd May). Tazio Nuvolari will be celebrated in the HGPCA’s Nuvolari Trophy for pre-1950 Grand Prix cars, while tribute will be paid to Richard ‘Mad Jack’ Shuttleworth in Motor Racing Legends’ ‘Mad Jack’ race for pre-War sports cars. For some Italy’s Tazio Nuvolari was the greatest driver of all time. The ‘Flying Mantuan’ was a motorcycle racing champion who found his metier in cars, famously winning at Donington Park in 1938 in an Auto Union. Drivers and cars are coming from Argentina, Belgium, France, Germany, Italy and the USA to honour Nuvolari by taking part. 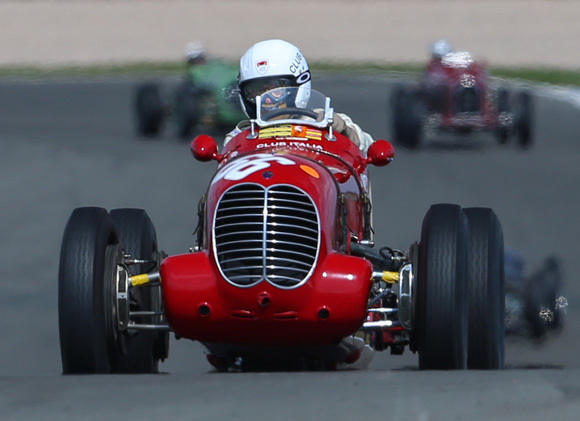 The race also celebrates the 80th anniversary of the 1936 Grand Prix at Donington Park, at which Richard Seaman and Hans Ruesch took the chequered flag in an ex-Nuvolari Scuderia Ferrari Alfa Romeo Tipo 8C-35. Marques represented in the HGPCA Nuvolari Trophy will include Alfa Romeo, Bugatti, ERA, Maserati, MG and Talbot Lago. There will be at least two unique entries, in the form of the Alta Norris Special and the Parnell MG, which competed at Donington Park in the late 1930s. Bugattis will include 35s, 37s, 51s and a 59, alongside 4CL, 6CM, and 8CM Maseratis. English Racing Automobiles (ERA) was successful in the 1930s and the voiturettes, with their supercharged Riley-based engines, remain hugely popular. The ERA contingent is planning six cars for the Donington Historic Festival, including R5B ‘Remus’ – raced in period by Prince Birabongse of Siam and Tony Rolt – and GP1, the sole ERA Grand Prix car to be completed pre-War. In 1935, daredevil aviator and racing driver Richard ‘Mad Jack’ Shuttleworth won the first Donington Grand Prix in his Alfa Romeo Tipo B (P3). His exploits in cars and aircraft are legendary, and his character fascinating; he once ordered a new Rolls-Royce, saying he needed it urgently as the one he’d bought only recently was being used for towing a muck spreader. Motor Racing Legends’ ‘Mad Jack’ race will, naturally, be suitably adventurous, promising 40 minutes of exhilaration with a driver change in the middle of it all. Spectators can expect to see a pack of monster Bentleys at the front of the grid, battling against the Invicta, the Alvis Speed 20 and Jaguar SS100 with its extraordinary double rear wheels. 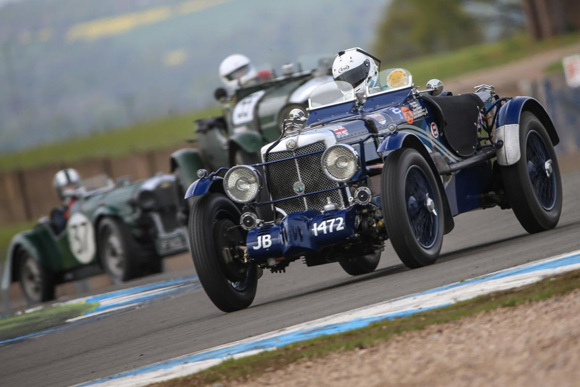 Jonathan Turner will reunite his Triumph Dolomite with Donington Park, a circuit it hasn’t raced on for 80 years, when it was driven by Tony Rolt in 1936. The grid will also feature three Talbot 105 team cars, which enjoyed significant international success in the early 1930s. Away from the competitive action, the ever-popular historic rally cars will be burning rubber once more, as the mighty Group B machines and the cars of the Historic Rally Car Register entertain the crowds. Historic karts will also return to Donington Park for the event, as will dozens of car clubs, who will gather in the Club Village in the infield. The race and rally paddocks are both open-access and always draw big crowds.